Real Estate investing is not everyone’s cup of tea and diving blindly right into it will cost you a great deal of money unless you follow some golden real estate investing rules. These rules were set to put you on the right track of achieving a successful and profitable investment. And if you are looking to build and create a successful real estate portfolio, these rules act as guidelines to guarantee you a growing wealth for long periods of time. If you can pack any real estate investing rules in your bag and take wherever you go, then these 6 golden real estate investing rules are definitely the ones you should consider packing. The number one golden rule in real estate investing rules is that you always look for the profits gained behind a certain purchase. In the buying process, one should look closer at a sale. Meaning that the most profitable deals are the ones that sell fast, whereas the overpriced deals are usually the ones left behind. Look for sellers who are highly motivated to sell their properties fast due to travelling or urgent need of money as these are the ones who will probably negotiate the price with you. When buying a real estate, you are competing with the market; hence you should be a savvy investor. Which is why, find the pearls amongst the plethora of listings and never ever get attached to a certain property. Find the property that offers you an excellent location, desirable structure and high rental potential and only then you guarantee to make money out of your investment. On the other hand, when you are selling a property you own, make sure you choose the suitable method to list it. Read the following article to find out more about the difference between exclusive listing and multiple listing methods. 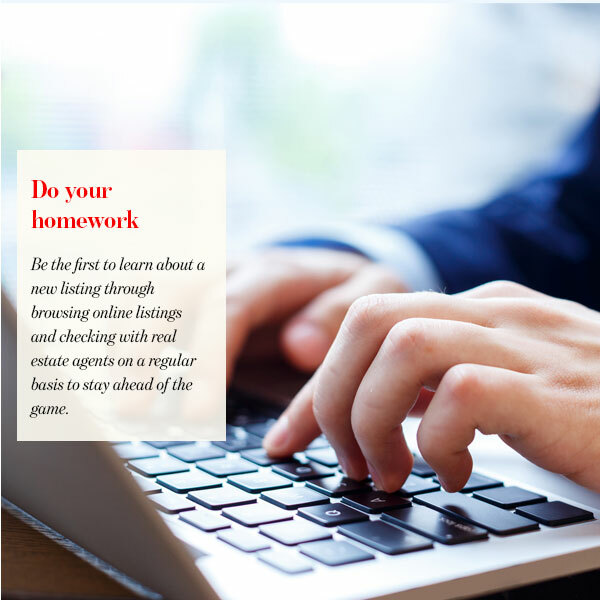 Be the first to learn about a new listing through browsing online listings and checking with real estate agents on a regular basis to stay ahead of the game. 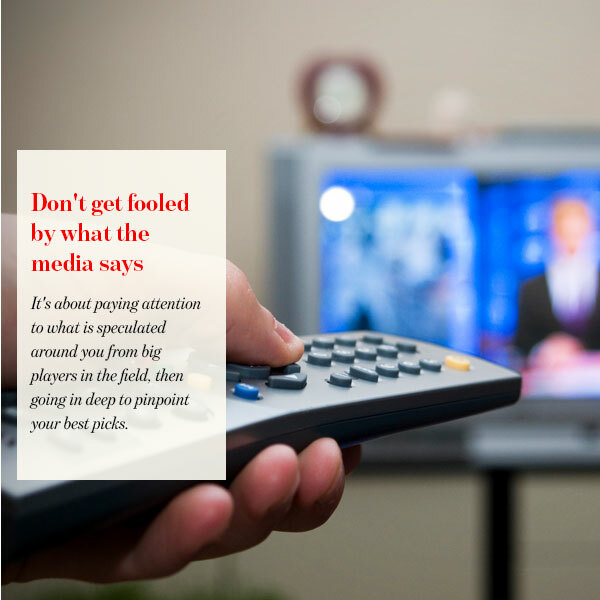 Check your local news and gain insights on your area of interest. Get yourself educated about different investment strategies as well as market trends. If you are planning on taking real estate loan, you should be aware of different mortgage plans and choose the one that fits your budget plan. 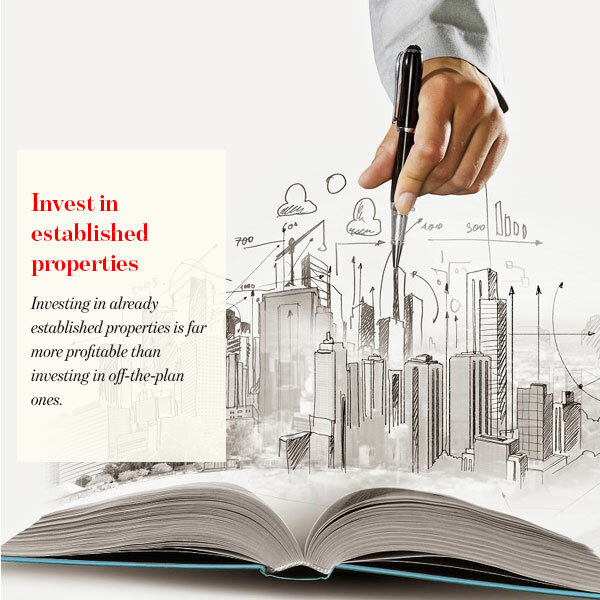 When investing in real estate, you should think long and build an empire through enriching your real estate portfolio. 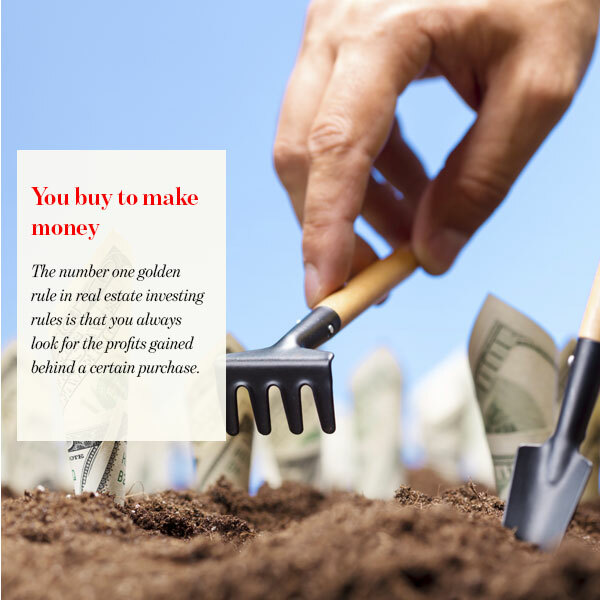 If you think your five years plan to make you a wealthy investor, then think again! Looking for a quick profit will only make you wealthy for a short period of time which after you are doomed to fall off a cliff. Hence, when thinking of investing in real estate; it is advisable to plan for many years ahead. 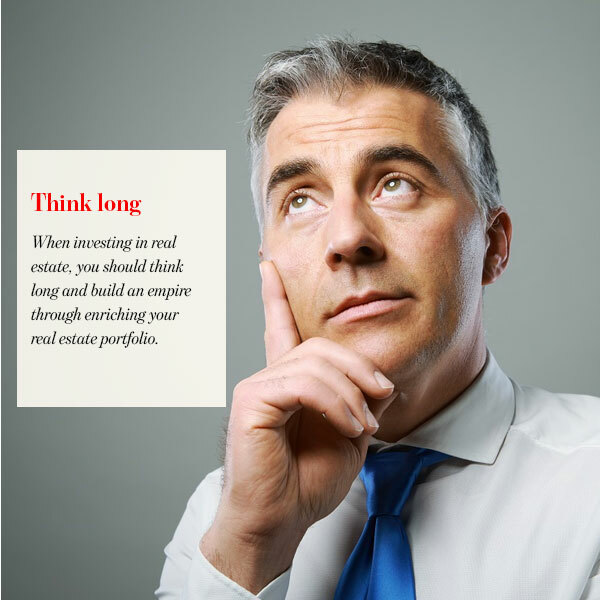 Don’t just think big when it comes to investing in real estate, you should also think long. Start planning that 50 or 100 years plan and create your own legacy. Even the most cautious investors fall victims for unexpected events. 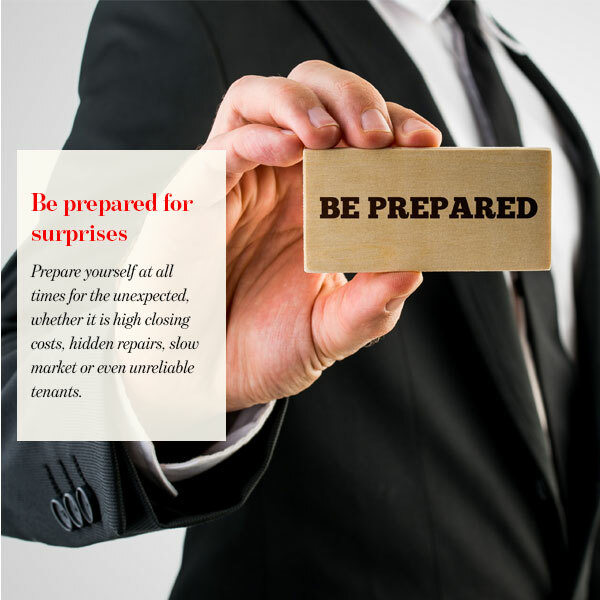 Prepare yourself at all times for the unexpected, whether it is high closing costs, hidden repairs, slow market or even unreliable tenants. It is during these times that real estate investors are tested and many just fall back and retreat. Like any other business, surprises and unplanned events are bound to happen. Hire yourself a property management company that will take care of all that is related to your investment from the rental collection, screening tenants to handling all repairs costs and marketing your property. However, real estate experts advise keeping an amount of money for emergencies that require immediate attention. This doesn’t mean to ignore what the news is saying about the market and dive in anyways. It’s about paying attention to what is speculated around you from big players in the field, then going in deep to pinpoint your best picks. Experts always recommend keeping an eye on the big picture while zooming in to guarantee a profitable investment that falls within your criteria. Yes! The real estate market isn’t a stable market but that shouldn’t hold investors from investing in it. Investing in already established properties is far more profitable than investing in off-the-plan ones. Offering a much better capital growth, already established properties guarantee you a profitable investment especially if they are located in an appealing area to prospect tenants and buyers. However, if you go after an off-the-plan property you are going to end up paying for the developer’s profit margins. Not mention you are gambling on a property you can’t see with you own eyes or evaluate it’s quality.